Embassy Racing Team Owner Jonathan France commented that Saturday's race had gone better than the new team could have expected, with only a few niggles, and all he could hope for on Sunday was a better result as the icing on the cake. Things went pretty much his way on Sunday, with a fourth position which could very easily have been a podium - a good points finish was absolutely fantastic for this brand new team. Sunday's race was dry at the start and looked like it would remain so (as much as you can ever predict the weather over the next hour at Donington, particularly when the GTs are there!). Jonathan had an easier time than on Saturday : no stress over tyre choices this time. The pressure was on Paula Cook instead, as she was to take the rolling start for the first time. It looked to be a cautious opening for Paula, but actually "the fuel pick-up problem was still there and it's worse when the car is cold, it was much better towards the end of my stint". Still, she was behind some pretty impressive opposition and the key thing was that she was keeping up with them, no doubt wishing the fuel was going where it should and when it should so she could go at the pace she wanted. 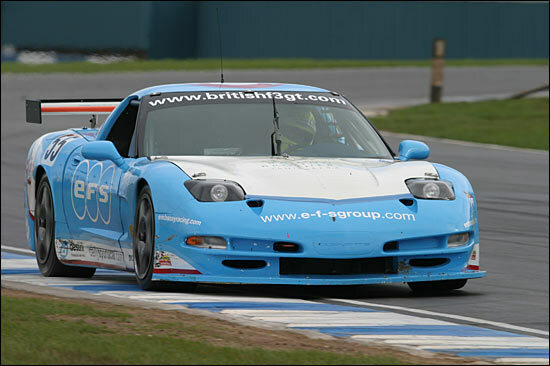 The highly distinctive blue and white EFS-liveried Chevrolet Corvette only really started coming into its own when the similar Xero-entered car caught up with Paula and pressured her into a bit of a dice. "I let him through because I was too slow with the fuel pressure to race him, but then it started sorting itself out and the tyres felt better so I was able to take good racing lines and push on, so I took him again and the car felt much better after that. I think I was second quickest on the track at one point." Certainly she was closing on the Porsche that won Saturday's race, and being only seven seconds behind it after nearly half the race (with fuel problems) was an excellent performance. Paula pitted just before half distance and Neil Cunningham received a nicely warmed up Corvette. The pitstop was much smoother than Saturday's, so clearly lessons had been learned - which is just what the first round is all about. Neil was as calm as ever on the outside, but deeply fired up on the inside. This is a man that loves his racing. 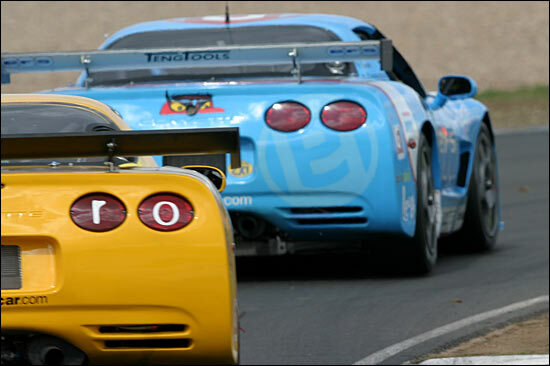 He set about the Xero Corvette, which had gained a place during the pitstops, and sliced through at the Old Hairpin. His next job was to catch Mike Jordan in the JWR Porsche, certainly not an easy task - but Neil and the Corvette were up to the job. "I was racing against the clock really, but I was trying to fight people wherever I could." 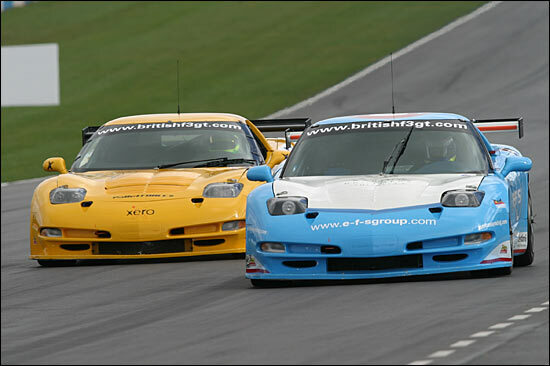 Despite a number of cars charging hard for the lead, Neil was in the quickest trio for a good while and was gaining hand over fist on the 2003 championship-winning Rollcentre Mosler, once Jordan had spat the black and silver car out behind him. Sweeping down the Craner Curves, Neil lined his man up at the Old Hairpin, but then saw the yellow flags and had to let the Mosler go again. "I could see I was going to get him, but I noticed the yellows and had to let him go again - it cost me a few seconds as I had to line up behind him and pass later in the lap - you just don’t know what difference that might have made to being passed by Khan… I knew I was up to third and knew if Khan passed me I’d lose it." 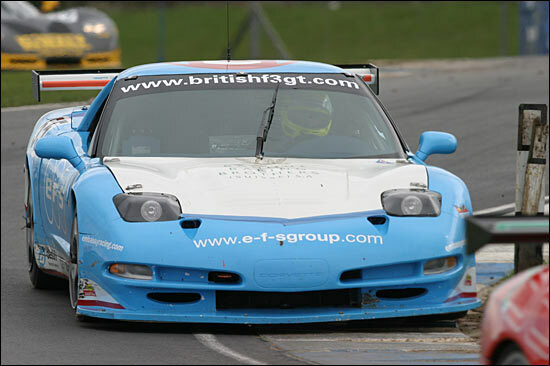 Third was actually partly inherited, owing to the lead car going off at Coppice, Mike Jordan picking up a puncture and Ian Khan getting a stop-go penalty - but then at least two of those incidents were down to mistakes, and Embassy weren't making any of those. It would have been all too easy to make a mistake as the skies opened five minutes from the end of the race….. but the organisers wisely decided to put the chequered flag out early as cars started slipping and sliding with no time left for a tyre change. The unpredictable Donington weather had done it again! Khan re-took third from Neil in the dying stages, but had only managed to eke out 4.8 seconds by the chequered flag, so it would have been very close indeed had Cunningham been able to put the Mosler behind him earlier. "When Khan went through I wanted to pretend I didn’t hear Jonathan’s instruction to let him go - but the last thing I was going to do when it started getting slippy was wreck Jonathan’s car. That Porsche was going like a rocketship anyway - has it got any restrictors?" Neil and Paula are still confident the car has much more to give, and Jonathan is intent on helping them get it. All in all it looks like a great team atmosphere building already. So big hearty slaps on the back all round for Embassy Racing. With the inevitable new-car niggles ironed out, podium finishes seem a certainty this season, which will be thoroughly deserved given the strength of the opposition. Embassy Racing has shown what it can do!